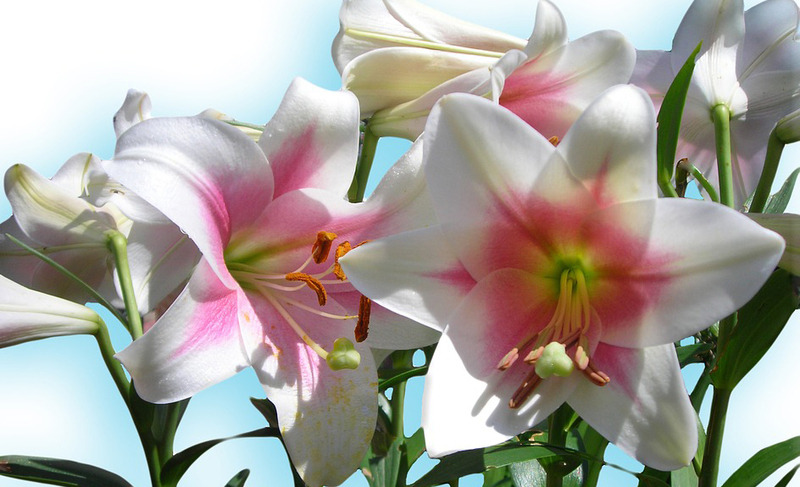 Q: I would like to know if there is such a thing as pink Easter lilies. I have some growing and wonder if they are common or rare. A: Lilies come in colors of white, pink, red, yellow and orange. The foliage looks about the same on all of them. What you have is a variety of lily but it is not truly an Easter lily. Q: My African iris has quite a bit of cold damage from the winter. About half of the leaves are browned and most of the tips of the leaves are also. Can I cut the whole plant back or do I need to individually pick out the dead leaves. A: The entire plant can be cut back. Use a pair of hedge shears and cut to within a few inches from the ground. Q: My heather bushes have frozen back. How far do I cut them back? A: You can wait for new growth to occur and then cut off the dead sections. You can also scrape the plant to find green wood and then cut into that area. The more cold damage, the further back the plant will have to be cut. Q: My lantana froze back during the winter. Will they come back? A: They will usually come back from low on the stem. Scratch the bark till green is found. The new growth will originate from the green area.